Who is the Hipster Housewife? She is a creator, a maker, a lover of all things unique and one of a kind. She is the cool mom building forts in the living room with her children. The best friend who shows up for coffee with a handmade card 'just because'. She's a reader, a crafter, a lover of good coffee and good conversation. She was not taught to be an artist, she was just born that way. She's me. She's you. She wants to be friends! 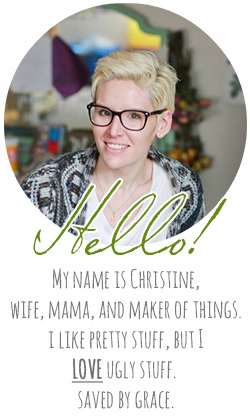 My name is Christine Errington and I am The Hipster Housewife. The most important things in my life are my three beautiful children, my amazing husband (The Hipster Husband), and my lord and savior, Jesus Christ. I'm a carpenter by trade, and take such joy in creating things with my two hands. I don't call myself an artist really, I'm more of a creator. I have had no formal training in the arts or in construction, but I make living doing both. I learned by doing, through years of trail and error and getting my hands dirty! I just love to make things that bring a little bit of happiness and beauty into the world. Whether it's remodeling your kitchen or creating a completely custom piece of art for your wedding, I put my heart into all I do, for my work represents who I am. I call myself the hipster housewife because I'm that funky mom who shows up to the bus stop covered in paint from my latest project. I like to make unique things and to be surrounded by unique people. My family and I live a truly handmade and homemade lifestyle. I wouldn't have it any other way.